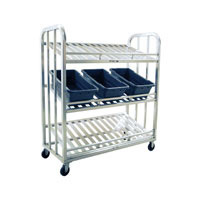 3-Tier Picking Cart is all-welded, heavy duty aluminum construction with each shelf set at a 30 degree angle for easy product selection. The cart is equipped with four 5" platform type casters, two swivel and two rigid. Specs: 59"W x 67 1/2"H x 26"D. Available options are Caster Locks (2), Corner Bumpers, Perimeter Bumpers and Vertical Bumpers.